Horsetail, Common Horsetail, Bottlebrush, Foxbrush, Mare’s Tail, Horse Pipes, Snake Grass, Scouring Rush, Scourweed, Pintop. Field horsetail, Equisetum arvense L., belongs to a prehistoric plant family that was dominant in the world 230 million years ago and significantly contributed to the formation of coal deposits. The Equisetum family contains over 30 plant species and is native nearly worldwide, excepting Australia, New Zealand, and Antarctica. The Pacific Northwest is home to about 20 Equisetum species. Field horsetail is a perennial plant that grows from underground tuber-bearing rootstocks. It is unique in that it has two types of stems and growth habits. First to emerge (early spring) are light brown fertile stems that are unbranched, leafless, and stand about a foot tall with terminal spore-bearing cones (resembling asparagus sprouts). These reproductive stems die back shortly after shedding their spores, during which time the second stem type—vegetative—begins to emerge. These more numerous sterile stems grow to 2 feet tall and produce whorls of fine green branches (modified leaves) that form at stem joints to create bushy plants that resemble miniature pine trees. Robert H. Mohlenbrock @ USDA-NRCS PLANTS Database / USDA SCS. 1989. Midwest wetland flora: Field office illustrated guide to plant species. Midwest National Technical Center, Lincoln. The stems and branches of horsetail have high silica deposits, making them abrasive and explaining their use by early Americans as scouring pads. The vegetative stems die back with the first hard frost. Field horsetail does not produce flowers or seeds. For reproduction it relies heavily on its extensive, creeping root system and to a lesser extent on spore production. Fleshy tubers arranged at joints of the deep-penetrating rhizomatous root system store energy reserves (carbohydrates) and provide the plant with a remarkable regenerative capacity. Giant horsetail (E. telmateia) is similar to field horsetail but is taller and more robust, with spore-bearing cones that are 4 inches long compared to the 1 1/2-inch-long cones of field horsetail. Field horsetail can also be confused with the related scouring ruse (E. hyemale) – although scouring rush differs in that it does not have the two different stem types. Instead, the stem of scouring rush are all fertile and resemble the fertile stems of horsetail except that they are green and have two black bands at their joints. All horsetail species are considered toxic to livestock (particularly horses), but are low in palatability and rarely eaten unless fed with hay. Field horsetail thrives in acidic, poorly drained sandy or gravelly soils and full sun. Although it is considered a wetland plant, it can also be found in drier areas. Cultural: Because horsetail does not respond to nitrogen fertilization and wants sunlight, its growth can be suppressed through the use of a fertility program and competitive cover crops. Other control options that have met with some success include the use of inorganic mulches and weed barrier fabrics. Improving drainage in the area can also be helpful. Mechanical: The tenacious root system of field horsetail makes it very difficult to control, particularly when using mechanical methods that can actually worsen the problem by spreading rhizomatous pieces that can regenerate. 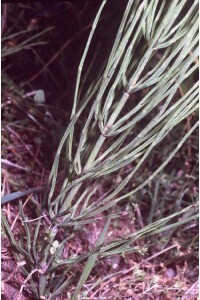 The fertile horsetail stems should be cut or burned before they form spores in order to reduce spread potential. Repetitive tillage or mowing over at least a 2-year period may be effective if timed to eliminate regrowth before the plants are able to replenish their energy reserves—shortly after emergence and before reaching 8 inches in height. Shallow tillage is not recommended. As is the case with most invasive plants, the most effective management approach will involve a combination of methods, such as applying herbicides after mowing. Chemical Control: Few herbicides have any effect on field horsetail and their use depends on the situation in which it grows. In noncrop areas, diclobenil (Casaron®) and chlorsulfuron (Telar® and Oust®) are labeled for field horsetail use. Various MCPA formulations will provide topgrowth control in grass pastures and cereals. Multiple chemical treatments may be necessary. Biological: No biological control agents are available.